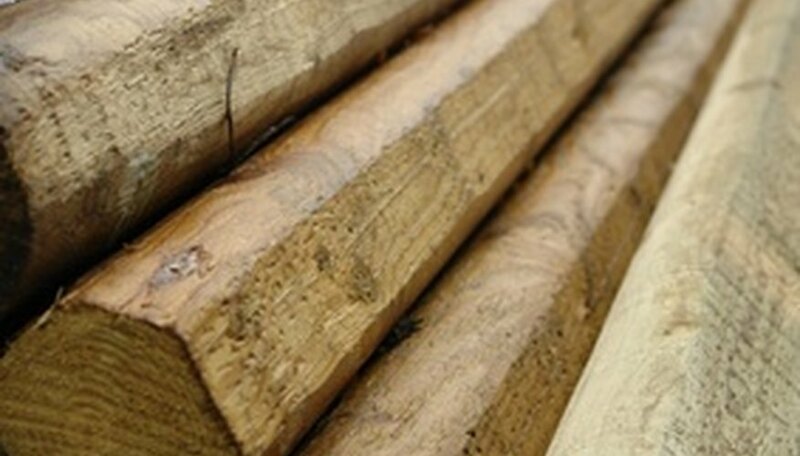 Landscape timbers are suitable for use when creating an edging border or raised bed for gardening. They are relatively basic to use and set up, are durable and help in creating a barrier to keep unwanted vegetation such as weeds or grasses out of the gardening space. Basic landscape timbers are 6 feet in length, so unless you have a vast amount of space to cover, two or three will cover a large area. Gardeners should be able to locate landscape timbers at their local home improvement, hardware or gardening store, and the timbers only require a few tools for connection. Prepare the area where you are using the landscape timbers. Clear the area of any unwanted grasses or weeds, allowing only the soil to remain. Measure the area to the length of the landscape timbers, adding 3 to 4 additional inches on both ends. This allows enough room to dig a trench and situate the timbers into the soil. Dig a trench that is approximately 3 inches wider and longer than the total length of landscape timbers you are setting into the ground. Make sure they are level so the timbers lay correctly into the area. Lay the first landscape timber into the ground, lining its end up to the end of the trench. You may require an additional person to help you, because the timbers are heavy and cumbersome to handle. Situate the next landscape timber into the trench, butting its end against the first one’s end. Add or remove soil from underneath it if it does not lie level into the trenched area. Pack the soil firmly around the timbers once they are properly situated into the trench. Prepare the area by removing grass and unwanted weeds. Measure the area to the length of the bottom layer timber, adding 3 to 4 additional inches, and dig an appropriately sized trench. Lay the bottom landscape timber into the trench, making sure it is lying level. Add or remove soil from its bottom if needed. Once level, pack the soil firmly around the landscape timber to hold it in place. Position the top layer of landscape timber on top of the bottom one. Match their ends up so they are lying perfectly matched on top of the other. Drill a hole into the top corner of each end of the top landscape timber. Use a drill bit that is slightly smaller than the landscape timber spike. The spike will permanently connect the two timbers together so they do not fall off each other. Position the timber spike into the pre-formed hole and use a sledgehammer to drive the spike completely into the hole. Repeat on the other corner of the timber to connect them together.